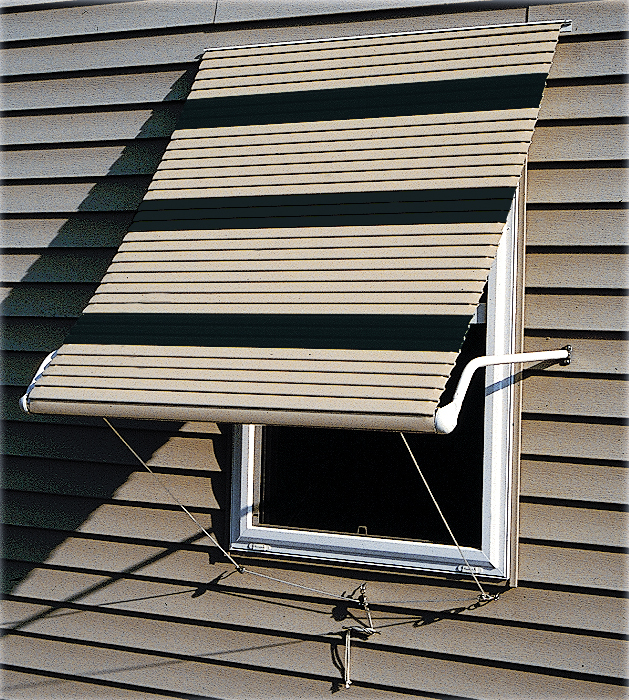 Aluminum roll-up window awnings designed with horizontal slants to blend in with your homes exterior. These aluminum roll-up awnings help protect the homes windows as well as the furnishings inside the home from harmful U.V. rays. Most awnings will do a good job of blocking out the sun but the roll-up awnings can do an even better job as they can cover a greater portion of the window as well as be roll-up partially or completely on those not so sunny days. Once installed there is never a need to take them down again since even in inclement weather they can simply be roll-up and stay of the way of high winds, major snow storms, dust storms or what ever mother nature plans to throw at you. The awning are available in sizes from three feet all the way out to ten feet and can be custom made in one inch increments to match with nearly every size window available. These aluminum roll-up window awnings are shipped fully assembled with all necessary hardware making for a quick and easy installation.